The last 24 hours have been a wine a culinary smörgåsbord. It all started late yesterday afternoon with the annual event The Hog in the Fog put on by the Russian River Valley Winegrowers. We were invited by my new employer and how could we turn that invitation down? There was fog (it’s Russian River after all). And there was a hog, several in fact, as well as chicken and beef. The event gets its name from being a pig roast and because it goes into the evening, when fog is usually present, they added the fog. Straightforward and to the point – just the way I like it. The first 2 hours of this event is a huge wine tasting with over 40 wineries offering up outstanding wines from the cool climate Russian River Valley.This area is mostly known for Chardonnay and Pinot Noir, but the reality is that there are many other varietals grown there including Sauvignon Blanc, Syrah and Zinfandel among others. We sampled to our hearts content. Luckily there were a few vendors with food, bread and chocolate to keep us from over-indulging. Then at 6:00, we feasted on grilled chicken, sliced beef and the most amazing pulled pork in a freshly made tortilla. Do I need to mention there was more wine to go along with the food? We continued to enjoy one of our favorite varietals, Zinfandel. Then to top it all off, there was brick oven baked apple pie a la mode. Unfortunately, there wasn’t any dessert wine. Then today we drove to Cloverdale and met up with our good friends that live up there. We took a short walk to Ruth McGowan’s pub. Out friends have been wanting to take us to this place since they moved up there. Mostly because they have a Dry Irish stout (think Guinness) that they have been raving about. So, we got a pitcher. And, wow, it did not disappoint. Back in 2005, my wife’s family and I took a trip to Ireland for about two weeks. We really fell in love with Guinness over there. It’s different because they don’t put all the preservatives in it. This Dry Irish Stout was the closest thing I’ve tasted to a real, true Guinness since that trip. It was awesome. But wait, this is a wine blog. Ok, we went back to their house and opened a bottle of this…. This is an imported French Champagne that’s sold at Family Wineries in Kenwood. I recently tasted there and picked up a bottle. And because all gatherings need a bottle of bubbly, I thought today would be a good occasion to open it. 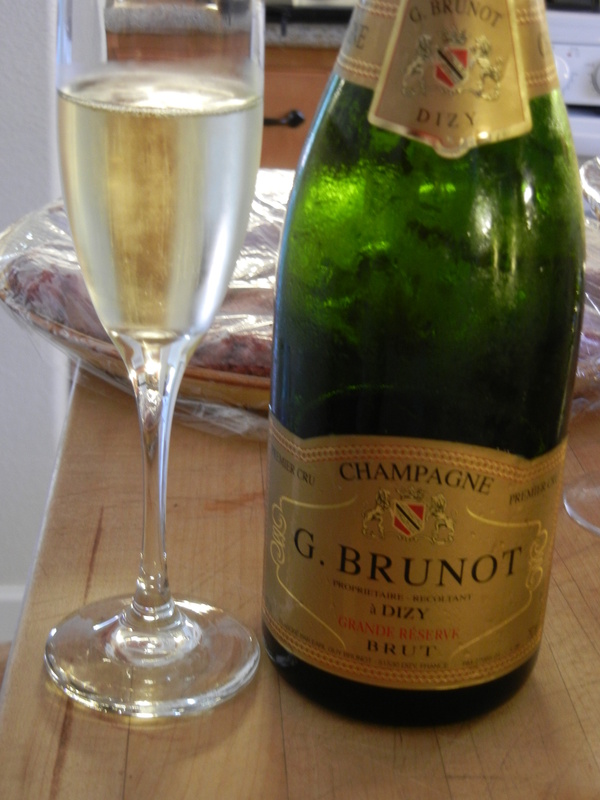 It contained some of my favorite Champagne qualities: creamy texture with tons of yeasty, bread-y aromas. I love that it has the word Dizy on it. It’s actually a town / region in France, but I like the irony. 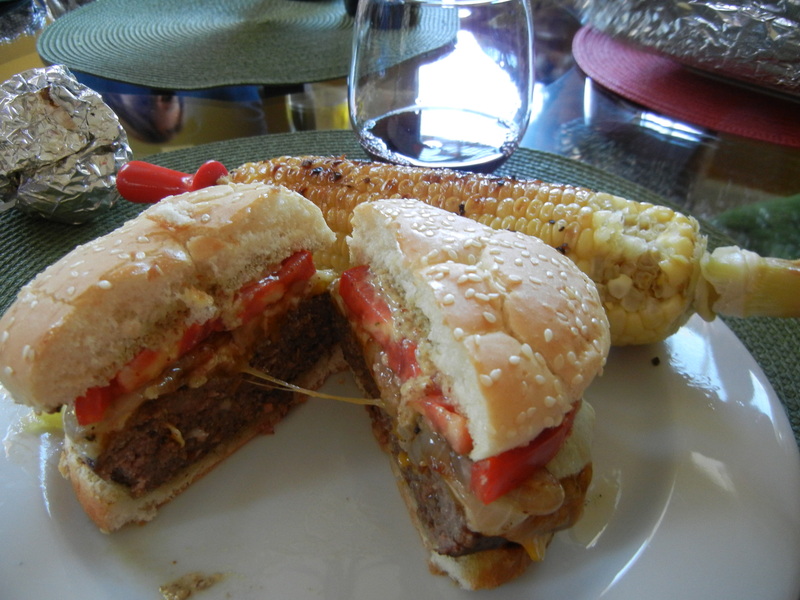 Then we fired up the grill and shortly after dove in to these…. That’s no ordinary burger. It was assembled with extra special ingredients and lots of love. Love in the form of bacon. Our friend cooked up an entire pound of bacon, chopped it up in a food processor and then incorporated it with about 3 lbs of hamburger meat. It was complete and total indulgence and worth every calorie. 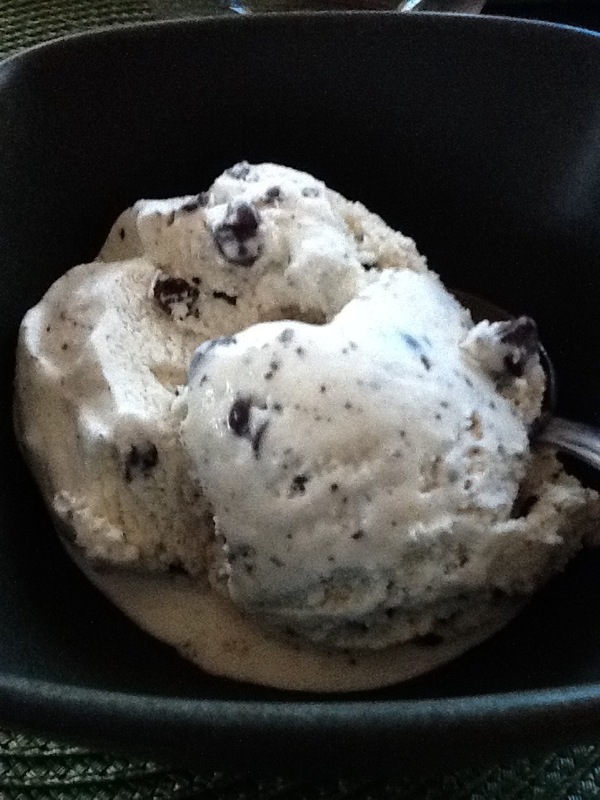 To round out our day, we had homemade Maui vanilla bean and Callebaut dark chocolate chip ice cream…. I’m done. I don’t think I’ll ever need to eat (or drink) again. Well, until tomorrow anyway.